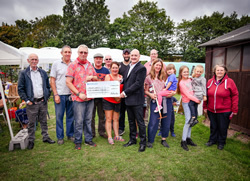 An allotment space in Burton, which grows fresh produce for those in need, has become the latest organisation to benefit from Russell Roof Tiles’ community fund. Nearly 30 volunteers at Mona C Allotments have been donating the vegetables and fruit grown as well as fresh eggs produced form the six chickens on site, to low-income families, food banks and pensioners for over three years. Now, with a £500 charitable boost from leading roof tile manufacturer, Russell Roof Tiles, Mona C Allotments will be able to improve facilities and grow even more produce to meet further demand of local families. The donation from Russell Roof Tiles, which has two sites in Burton and a further site in Lochmaben, is part of the team’s ongoing fundraising efforts which has seen various community organisations benefit over the past few months. Volunteer, Brian Galvin at Mona C Allotments said: “Every volunteer at the allotment grows produce as a hobby in their spare time and it’s great that we are able to help those in need. Earlier this year, Russell Roof Tiles announced the launch of its Community Fund – a fundraising pot which the manufacturer contributes to through fundraisers and then chooses local community organisations to share the monies raised. Andrew Hayward, Managing Director at Russell Roof Tiles said: “The staff have been working hard this year, to raise vital funds for charities and the local community and I am delighted that our latest efforts will see Mona C Allotment benefit.